As a child I was a fan of Beverly Cleary's Ralph S. Mouse series and as an adult read some of those books to my own children. My daughter ended up getting in Cleary's Ramona series completely on her own, but for some reason I never gave those a shot. While she is now onto books aimed at a slightly older audience, and my son doesn't seem to have much interest in Ramona at all, that's not stopping me from revisiting what exactly has made the book such a children's classic. Classic? Well, yeah. For a book written in 1955 to have survived this long, still manage to grab the attention of young readers, and not feel terribly dated, I'd say that it fits as a modern classic. Granted, I wasn't in love with the book. A lot of what is supposed to be funny (i.e., the antics of Ramona), I didn't see as particularly amusing. But that, I suppose, is coming from adult eyes. 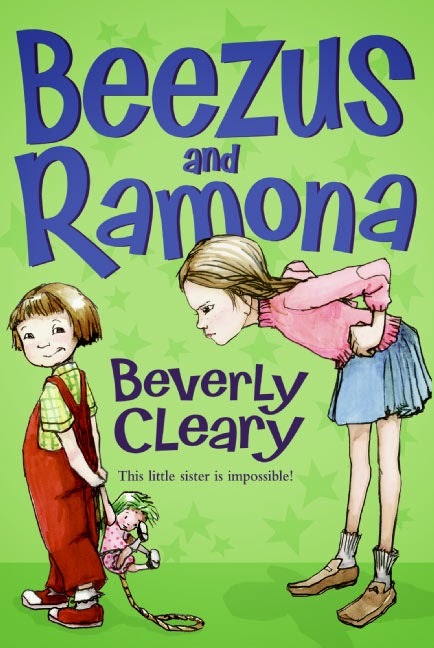 In this book Ramona is only four and unlike the later books, is told from the perspective of her older sister Beezus. Beezus spends most of the book extremely frustrated with Ramona, and I can hardly blame her, but I was equally as frustrated with the adults in the story. Not only does she never get in serious trouble, she's often rewarded for her bad behaviour! She ruins a library book, so the librarian lets her keep it. She takes a bite out of each apple in an entire bag, so her mom turns it into apple sauce she can eat. She invites all the kids in her nursery school to a party at her house, without telling anyone at home that she had done so. They all show up unexpectedly one day, and Ramona's allowed to have the party while her mom rushes to get snacks together and Beezus is forced to entertain everyone. Why? Apparently because she's four and that's what four years old do. But aren't they adults and isn't part of what adults are supposed to do is teach right from wrong and show that there are often consequences for bad behaviour? I'm not advocating spankings or anything as severe as that (I may be on my way to becoming a grumpy old man, but not that grumpy) but I wish at some point someone simply said "no" to the girl and certainly hadn't taught her that disrespecting others or property can have payoffs. For all that, I did like the complexity that Cleary dealt with the idea of unconditional love. Beezus spends much of the book racked with guilt. She knows she's supposed to love her sister, but because of the aforementioned behaviours, doesn't always feel that way. Finally, after a bit of a breakdown, her mom and aunt help explain that it's natural for her to feel that way from time to time. I don't think this is an issue often dealt with in children's books, and while I think I would explained it slightly different— that being frustrated with someone doesn't mean you don't love them— I was happy that the adults finally did their job! I still love Beverly and so do today's children. Despite having a resident cat named Ramona, I have never read any of these books. My Ramona does seem considerably more well-behaved than the literary one though. Madame La-bas: I agree that kids today still enjoy her. Barbara: A well-behaved cat? Tradesies?